In 2016, one of the most important, and complete, archaeological sites in northern Greece, the ruins of the Ancient Walled City of Philippi, between the modern cities of Kavala, Mt. Paggaion, and Drama, made UNESCO’s list of World Heritage sites and is now the 14th UNESCO World Heritage archaeological site in Greece. Once the Thasian colony of Kinides, conquered in 356 BC and renamed Philippi by Philip II of Macedon, Alexander the Great’s father, Philippi receives about 50,000 visitors a year. 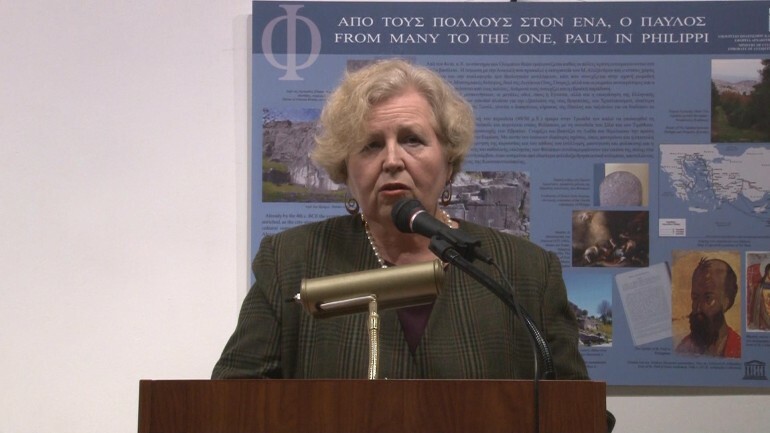 Stavroula Dadaki, of the Ministry of Culture and Sports, Ephorate of Antiquities of Kavala, and director of the excavations, one of a contingent of Greek archaeologists and others involved with Philippi travelled to New York for the opening of the photographic exhibition, Philippi: A Landmark of European Heritage together with the curator of the exhibition, Michalis Lykounas, archaeologist with the Ephorate of Antiquities of Kavala. 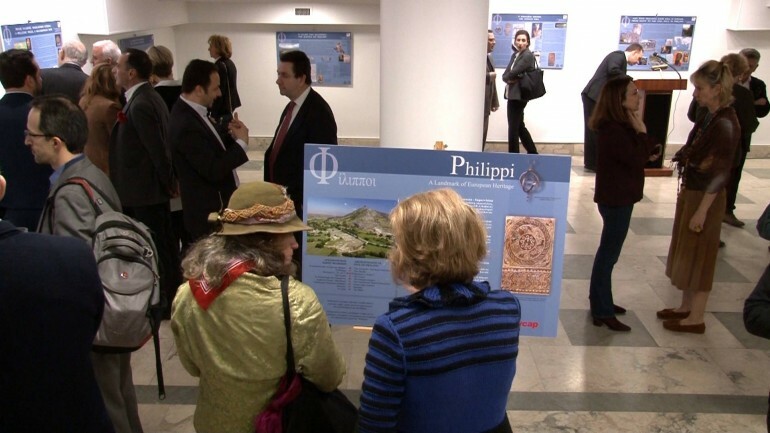 Hosted by Consul General Dr. Konstantinos Koutras at the Consulate General of Greece in New York, the exhibition of wall-mounted plaques with explanatory texts, photographs, and maps showing the many focal points of Phillipi, opened on January 8. Appropriately, excellent Macedonian wines by Chateau Nico Lazaridis, Adriani Drama, and mezedes by Titan provided atmosphere. With continued archaeological research and focused efforts by the Ministry of Culture with the assistance of European funding programs, Philippi will be recognized globally and attract more visitors within five years, said Stavroula Dadaki, followed by Michalis Lykounas, who spoke about the history of the site. The city of Philippi in the region of Eastern Macedonia-Thrace, was built in a strategic location which brought it to the forefront of major historical events. The Battle of Philippi, on the Plain of Philippi, where Cassius and Brutus were defeated, opened the way to Empire for Octavian, “a watershed not only for the history of Philippi but the entire Roman Empire.” The Via Egnatia, the great road joining East and West—built on an ancient route linking Europe and Asia—passed right through the city. important military and commercial road in antiquity for more than 2,000 years, the Via Egnatia played a key role in the history of the Roman, Byzantine, and Ottoman empires. Philippi played a decisive role in the expansion of Christianity. In 49/50 AD Paul the Apostle visited the city and baptized the first European Christian, Lydia, a porphyra dye merchant and others in the Zygaki River. From there, Christianity spread throughout Greece and the rest of Europe. To this day, said Lykounas, people travel to Philippi to be baptized in this river. The archaeological remains of the city attest to its growth particularly during the Roman and early Christian period, and represent important stages in the history of architecture. Because the history and culture of the city are evidenced in their entirety, Philippi is one of the most astonishingly complete archaeological sites in northern Greece. The growth of the city over time, an administrative center, public space, religious buildings, remains of residences, workshops and cemeteries reflects the influences of Rome, and later, of Constantinople. The Acropolis—The Rock Sanctuaries at the summit of the fortified hill above the city, the Theater, Basilicas A, B and C, the Forum, the Octagon complex, the Commercial Market, Urban Islets, the Walls, the city’s road network, and the Museum, whose collection encompasses a long period, from prehistoric times—when the first traces of habitation in the wider area of the ancient city appeared (traces of grapevines indicate that the first winemaking in Europe may have taken place here) until the late 14th century. Near the archaeological site is the important prehistoric settlement, Dikli Tash, where evidence suggest habitation from approximately 6200 BC with continuous use through the Byzantine period. 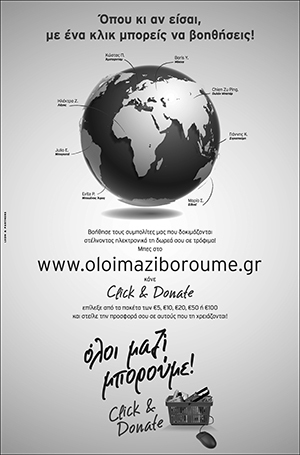 Lykounas praised supporters of the effort to bring the exhibition to the United States, saying, “This exhibition would not be here without the participation of a number of people who gave us ideas and created what you see. Our graphic designer Elsa Nikoletou worked through several nights to finish the designs before we printed them. But even the smallest effort cannot be realized if there is no money. We were very fortunate to have not only financial but also moral support from a very dynamic high-tech company, Raycap, in our region. Not only does our region have antiquities, but also a very strong future that enables us to attract investors.” It is hoped that the exhibition will travel to other cities in the US. Lykounas expressly noted that the exhibition’s organizers offer individual tourist guides starting from the city of Kavala with the wish that all present at the exhibition would visit this year.